I was intrigued when I saw a dish drying mat, hanging in a store. I touched it and looked it over. It sounded too good to be true. Supposedly these mats hold four times their weight in water. I put it back, feeling very frugal. During the next two weeks, as I filled up my tiny plastic dish drainer (my double decker dish drainer was left back in China), I kept wishing for that drying mat. It would be nice to have an absorbent surface to lay these extra dishes on. I cook from scratch, and even though I have a dishwasher right now, I still end up with a lot of things that don't fit or can't be put into a dish washer. That means I still do quite a few dishes by hand. And, wow, has it been handy! My purchase was just in time, too. I had a family of four as house guests, and I used the mat several times each day during food preparation and clean up. It worked like a charm. The claim that it holds four times its weight in water is absolutely true. Now I think I should buy at least one more so that I have one to use while the other is being washed. Why Did I Wait So Long to Buy a Dish Drying Mat? A dish drying mat can be easily folded and put away. It is far less bulky than a dish drainer of any type. It offers a nice padded surface that the dishes slightly sink into, making them unlikely to tip over. The dish drying mat will not scratch counter tops or leave rust marks like some dish drainers. 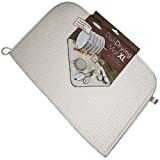 The dish drying mat is large and holds a good deal of dishes. No more water dripping off the counter, across the cabinet doors, and onto the floor. The mat absorbs it all. 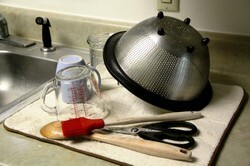 A dish drying mat can be used under a conventional dish drainer to catch run off. The dish drying mat dries quickly for your next round of dish washing. Besides drying dishes on the countertop, a dish drying mat is handy for other purposes. When I'm washing veggies for a salad, I don't like that puddle of water that accumulates on the countertop. I used to place the wet foods on top of dish towels, but if I was washing a lot of produce, I might have to change the towel two or three times. The microfiber dish drying mat can hold a lot of water. I've loaded up lots of fruits and vegetables without any water leaking out. The mat is also slightly cushioned, so the fruits and vegetables sink down a tad, just enough to keep them from rolling off the counter and onto the floor. In the photo, you can see some lucious summer peaches and some zesty peppers I've just washed and laid to dry on my mat. If you do use the drying mat for drying produce, be sure to wash it often so that no food residue is left to get on clean dishes later. I normally just flip it over if I switch to holding dishes. Then I give it a wash in the next load of dish towels. I discovered this use quite by accident. Some kind friends dropped by with a casserole to share and put it onto my empty dish drying mat that hadn't yet been folded and put away. The official manufacturer's instructions say not to use the dish drying mat as a hot pad. It's not designed for that purpose. But with common sense, you use it for warm items that have cooled a bit. Because my dish drying mat is often sitting on the counter, I discovered this third unconventional use. A dish drying mat makes a wonderful foundation for a kitchen work surface such as a cutting board, a baking sheet, or a mixing bowl. I love the slight cushion and traction that it offers. How Big is the Dish Draining Mat? The mat pictured and linked here is 18 inches by 24 inches. You can get an idea of the size by thinking about the items placed on top of it -- a 2 cup measuring cup, a colander, and a pastry brush. How Do You Like to Let Your Dishes Dry? I use the dishwasher exclusively. Dishes are never on my counter top. I use a normal dish drainer in plastic, stainless steel, or wood. I use a double decker dish drainer. I put dishes on to a towel on the counter. I use a dish drying mat. I use a combination of things. My dish drying mat has a care label which, if I know what the symbols mean, tells me exactly how to care for it. I didn't know what the symbols meant, so I printed out this handy chart (PDF) and affixed it to the inside of my laundry room cabinet for quick reference. According to the chart, the dish drying mat should be washed in cold water without bleach. It can be tumbled dry on low heat, but I prefer to let mine air dry. It seems ridiculous to include, but the label shows that a dish drying mat should not be ironed (as if anyone would iron a drying mat). I have washed my dish drying mat in warm water with my dish towels. It turned out just fine, and I felt that it was getting cleaner than merely using cold water. When counter space is limited, a double decker dish drainer is a great help. No more boring metal recipe files. These boxes are functional and pretty. My favorite Dutch oven is made by Calphalon and will last a lifetime. This is a tool that I use several times a week to make smoothies, salad dressings, and chopped veggies. Declutter your kitchen and make cooking easier with a cookbook stand for your kitchen counter top. How to cook homemade blueberry muffins from scratch using whole wheat flour and honey. These muffins are clean eating and full of nutrients. The zing of lemons balances the dense texture of a traditional pound cake. In this recipe, you juice and zest fresh lemons for the maximum lemon flavor. To those who have stains - sit a nice towel on top of it or go get some new ones when they are on sale. I saw the small ones before Christmas for $3.99 each. I recently moved and don't have a dishwasher here so had to go buy drainboard and strainer. This is also my first time with well water and the drainboard I bought did not have enough of a tilt. I was getting water everywhere and major salt spots. I was trying everything to prop up the back of the drainboard so water would drain into the sink and of course it was a huge headache. 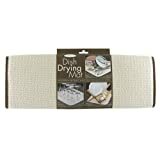 I saw a drying mat in use at Thanksgiving at MIL's house and raved about it so much that hubby got me a really big one for Christmas, (He is the absolute worst gift giver- but he's adorable :). I have already used it for all of the reasons mentioned, and arrived here while Googling - "how often to wash dish drying mat". I use it under the drainer instead of the crappy drainboard and also by itself. Today I found out how great if is for sitting my washed veggies on. Love it! I love this mat, but stains have appeared that won't wash out. I don't prepare or place food on it. I am tempted to bleach it and sun dry. Any tips? As a mom, I love this product! I would check out The Dish Drying Mat's facebook page (http://www.facebook.com/TheOriginalDi...). They're currently having a contest where the first 500 applicants get a a free Dish Drying Mat and the grand prize is $1000 to Bed Bath and Beyond! my daughter got me a dish drying mat for Christmas and it's fast becoming one of my favorite things...now I'd love a large one as a bath mat...possible ? my mat has stains on it and I have tried everything to clean it! can you help me? There are always things left over that have to be dried on the side. A cloth that really absorbs all the water is perfect! I place my dishes on kitchen towels to dry (not an option in your poll) so I am thinking that I must have one (or 2) of these! I have to admit I have never seen this dish drying mat and I need one! I usually just grab a dish towel to put dishes washed by hand. but this would be so much better. You sold me! Well, this is certainly interesting. I am not a dishwasher person either. And I use a drainer, plastic, but this is intriguing. Because I always seem to have something left over or I don't want it scratched or hurt in anyway. This could be very useful. Thanks Jimmie.